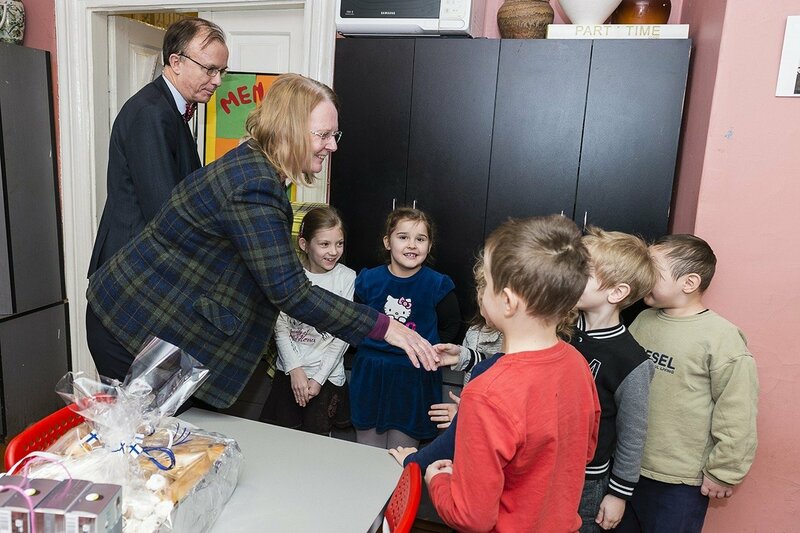 Earlier this week the Ambassador of Finland to Lithuania and Mrs Michelsson visited a kindergarten in one of the poorest areas of Vilnius. Mrs Michelsson carrying a large bag of home knitted warm woolen socks and the Ambassador with an enormous box of sweets in hand brought some joy to children that possibly see very little of that at home. Kindergarten Nendrė offers a safe and warm place for about 40 Children. There were many happy faces when the ambassador gave each of the children socks knitted by a Mrs Tua Juslin, a nice old lady, in Finland. The socks had all been knitted in the Finnish national colours of blue and white. Children, being children anywhere, they saw many creative uses for the woolen socks. There were festive Christmas carols, some exchange of Christmas wishes in several languages. In exchange for the Finnish 'Hyvää joulua', the Swedish ' God jul', there was the Lithuanian ' Linksmų Kalėdų' offered in return. Some most surprising answers were given by the children when they were asked about the famous inhabitant of Korvatunturi in Finland dressed in a red rob and wearing a white beard. Luckily, the ambassador, a man with an extensive knowledge about mythical figures saw Santa Claus rightfully identified as a man that is kind to children and well-behaved adults alike. The NGO kindergarten "Nendrė" is an initiative of the Åland Islands Peace Institute in Finland and women's club "Devyndarbė" in Vilnius. Established in 1998, it offers services to disadvantaged families in Šnipiškės, one of the most underprivileged neighbourhoods in Vilnius, located in the shadows of glitter, power and money, just a few hundred meters away. Nendrė offers pedagogical and practical experiences and ideas developed in Lithuania and the Nordic countries. The kindergarten Nendrė has developed a unique social and pedagogical models working with vulnerable families.